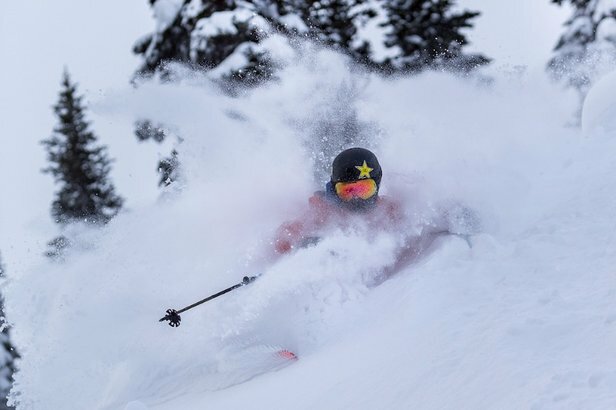 Tomer's Take: Ski Taos or Angel Fire on Friday, Schweitzer, Taos or Wolf Creek on Saturday, Schweitzer or Banff on Sunday and Steamboat on Monday. The pace and intensity of storm systems hitting the West Coast decreases a little over the next five days, but it remains an active pattern with one to two storm systems lined up. 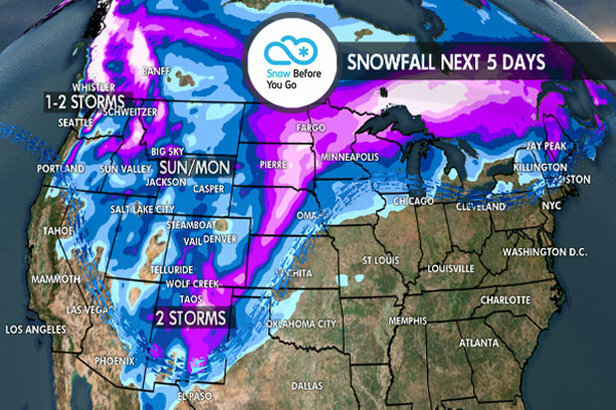 The storm systems will send light to moderate snow accumulations across the Intermountain West. In the Northeast, it's very similar to last week with a large, warm storm system early then a couple follow up smaller snowfalls. Overall, the official line is that we're in ENSO-Neutral conditions. That means we have not yet reached El Nino status in the South Pacific. However, the sea surface temps are all warmer than normal in the key zones. The forecast continues to call for a 90 percent chance of El Nino very soon. Residual snow ends on Thursday morning then a larger storm system arrives gradually on Friday with light mountain snow initially in the high Cascades and volcanoes. The intensity of the snow increases Friday night through Saturday. Heavy accumulations likely. Snow continues on Sunday turning lighter then ending. Residual snow ends on Thursday morning then a larger storm system approaches gradually on Friday with light snow initially. Snow intensifies on Saturday. Moderate to heavy snow accumulations. Snow tapers off on Sunday. A clipper is possible Monday night into Tuesday with light snow accumulation. A large storm system approaches on Friday gradually with light snow initially. Then snow intensifies between Friday night and Saturday. Snow amounts stay heavy through Saturday night. Snow tapers off on Sunday morning. Another storm system is possible by Monday night into Tuesday. The storm track is not conducive to snowfall at Tahoe or Mammoth over the next five days. Scattered areas of light snow are possible on Thursday (more likely in Utah). Friday is drier, except in Colorado where a small southern track low could push light snow through Southern Colorado, possibly making it as far north as the I-70 corridor ski areas. By Saturday it's dry in both states. The next storm approaches on a fast northwest flow on Sunday. Snow hits Utah first by midday Sunday then into Colorado by Sunday afternoon. Snow continues on Monday. Moderate snow accumulation in Utah's Wasatch Front, including Alta, Snowbird, Brighton, Solitude, Snowbasin and Park City. Moderate accumulations in Colorado with the chance for heavier accumulation if the northwest flow sets up correctly. I'd look to Steamboat, Vail, Breckenridge, Loveland, A-Basin, and Winter Park on Monday. Another wave of snow is possible Tuesday night. 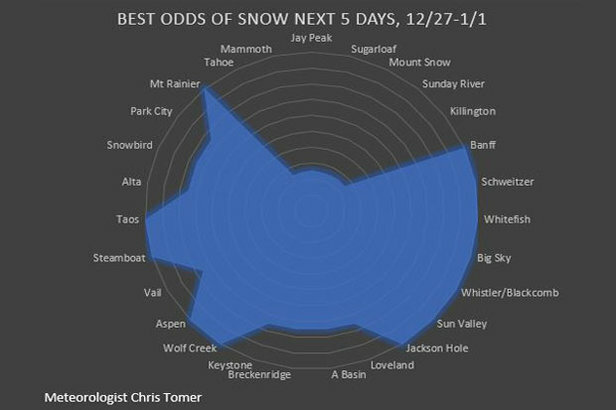 Ski Resorts with the best chances for snow through this weekend, 12.27.2018. Snow winds down on Thursday morning. It should be a great powder day at Taos. The next storm hits with moderate to heavy snow accumulation between Thursday night and Friday. Friday and Saturday should be excellent powder skiing days. Another snowfall is possible by Monday night to Tuesday. A large warm storm system hits between Thursday night and Friday. A mix of rain and snow is possible at the ski areas before changing to rain and then back to snow again by Saturday morning. Lake effect snow is possible on Saturday. Another larger storm may impact the area Monday night to Tuesday with ice, snow and rain.